^ a b c John Newman (1991). Geshe Lhundub Sopa (ed.). The Wheel of Time: Kalachakra in Context. Shambhala. pp. 51–54, 62–77. ISBN 978-1-55939-779-7. ^ Dalai Lama (2016). Jeffrey Hopkins (ed.). Kalachakra Tantra: Rite of Initiation. Wisdom Publications. pp. 13–17. ISBN 978-0-86171-886-3. 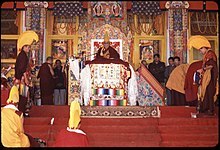 ^ 14th Dalai Lama (1985). Hopkins, Jeffrey (ed.). Kālachakra Tantra: Rite of Initiation for the Stage of Generation: a Commentary on the Text of Kay-drup-ge-lek-bēl-sang-bō (2 ed.). London: Wisdom Publications. p. 212. ISBN 978-0-86171-028-7. The external Kālacakra refers to all of the environment - the mountains, fences, homes, planets, constellations of stars, solar systems, and so forth. ^ John Newman (2015). Donald S. Lopez Jr. (ed.). Buddhism in Practice (Abridged ed.). Princeton University Press. p. 203. [c] Johan Elverskog (2011). Anna Akasoy; et al. (eds.). Islam and Tibet: Interactions Along the Musk Routes. Ashgate Publishing. pp. 293–310. ISBN 978-0-7546-6956-2. ^ John Newman (1985). Geshe Lhundub Sopa (ed.). The Wheel of Time: Kalachakra in Context. Sambhala. pp. 56–78, 83–86 with notes. ^ a b John Newman (1985). Geshe Lhundub Sopa; et al. (eds.). The Wheel of Time: The Kalachakra in Context. Shambhala. pp. 56–79, 85–87 with notes. ISBN 978-15593-97-797. ^ Alexander Berzin (2007). Perry Schmidt-Leukel (ed.). Islam and Inter-faith Relations: The Gerald Weisfeld Lectures 2006. SCM Press. pp. 230–238, context: 225–247. Khedrup Norsang Gyatso; Kilty, Gavin (translator) (2004). 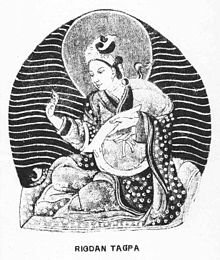 Jinpa, Thupten (ed.). Ornament of Stainless Light: An Exposition of the Kālacakra Tantra. The Library of Tibetan Classics. Wisdom Publications. p. 736. ISBN 0-86171-452-0.